Thanks in large part to the efforts of three Aboriginal players, a women’s collegiate hockey team won a league championship this season. Even more impressive was the fact the Morrisville State College Mustangs were just in their second year of existence. The New York-based Mustangs were led by graduating captain Kanekaroroks McComber, who is from the Mohawk community of Kahnawake, Que. The club’s roster also included a pair of Aboriginal rookie players from Manitoba; Vanessa Klimpke from the Roseau River Anishinabe First Nation and Renee Stevenson from the Peguis First Nation. The Mustangs, an NCAA Division III squad, posted an overall record of 20-6-1 enroute to winning the seven-team Colonial Hockey Conference (CHC). The CHC itself has only been operating for two seasons. Since the circuit is in a probationary process, its league champions during the first two years did not advance to further play. Starting next season though the CHC champs will move on to NCAA play-downs, culminating with a national tournament. McComber admits she was not initially thrilled about having to attend Morrisville State. She played her first two years of college eligibility at Vermont’s Norwich University, an NCAA Division III powerhouse in women’s hockey. Though she received some scholarships, it still cost about $25,000 (U.S.) for McComber to attend Norwich University her freshman year. Her tuition fees were hiked about six per cent the following year. And that is when her father insisted on finding a more inexpensive alternative. As it turned out, since she is a dual citizen, McComber was considered an in-state student at Morrisville State. And thanks to some scholarships and additional funding from an education fund from her First Nation, she only had to pay a limited amount (a mere $175 a year ago and $1,000 this year) for her schooling in Morrisville. Mustangs’ coach Melissa Lomanto is thrilled McComber ended up at Morrisville State. She was voted as the club’s captain by the players last year as well. And not just on the ice. Though she might continue to play hockey recreationally, McComber’s competitive days are now behind her. After her school year finishes, she’s planning to return to Kahnawake and work in her community. McComber ended her final collegiate season in sixth place in the conference scoring race. She earned 23 points (eight goals and 15 assists) in 24 matches. Her two Aboriginal rookie teammates had even more points. In fact, Klimpke won the league scoring race, racking up 36 points, including 23 goals in 26 contests. Stevenson also had an immediate impact with the Mustangs. She appeared in 21 games and placed third in the league scoring race with 30 points, including a league-high 21 assists. Besides Morrisville, the Colonial conference also includes another New York-based club in Canton. The league also features teams from Rhode Island, Maryland and Massachusetts. Besides Klimpke’s rookie-of-the-year award, all three Aboriginal players in the Morrisville lineup received some league-wide accolades. Klimpke was named the league’s first team all-star and was also a member of the all-rookie team. Stevenson was chosen a second team all-star and McComber was named a third team all-star. 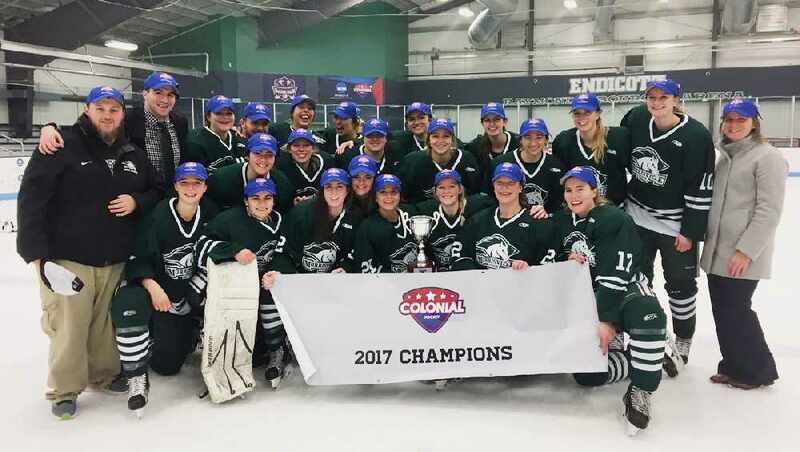 The Mustangs captured their league championship on March 5 thanks to a 3-1 win over the host Endicott College Gulls, who are based in the Massachusetts city of Beverly. That result was considered somewhat of an upset. That’s because the Gulls had placed atop the conference regular season standings with an 11-1 record. Morrisville State, however, was the only squad that defeated Endicott College in regular season action, posting a 2-0 victory in early February. The Gulls rebounded from that loss to beat Morrisville State 3-2 the next day. Morrisville State finished second with an 8-4 regular season mark.